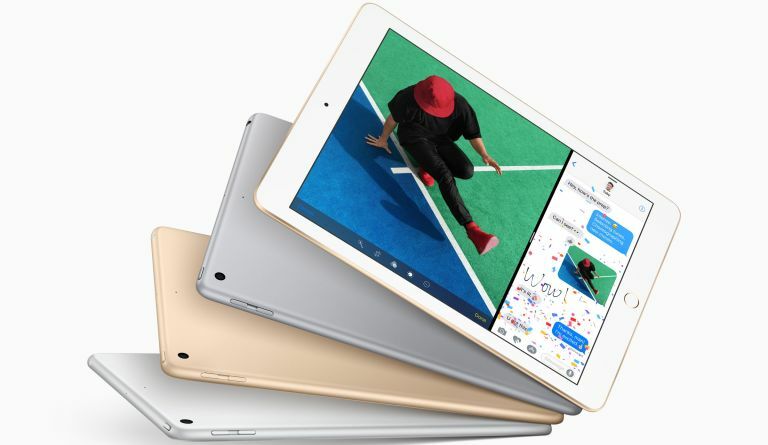 Apple has replaced the iPad Air 2 with a new iPad, referred to simply as 'new 9.7-inch iPad' or, 'new iPad', as we're sure it will be more commonly known! Apparently the new iPad features a 'brighter' retina display as well as the Apple A9 chip (plus the M9 co-processor) from the iPhone 6S, 6S Plus and iPhone SE. iPad comes in silver, gold and space grey (the same as before) and starts at £339 (or $329 USD) for the 32GB with Wi-Fi model and £469 (or $459 USD) for the 32GB Wi-Fi + Cellular model. The 32GB and 128GB storage options remain the same as do the 8 megapixel and 1.2 megapixel cameras. It is a bit shallower in depth at 6.1mm versus the 7.5mm of the older model but the height and width remain the same. Also announced today was a new red version of the iPhone 7 and iPhone 7 Plus as well as the new iPad mini 4, available in silver, gold and space grey, now offers more capacity for the same price starting at £419 (or $399 USD) for the 128GB Wi-Fi model and £549 (or $529 USD) for the 128GB Wi-Fi + Cellular model. Yep, you read that right, the mini 4 now appears to be only available in a 128GB variant now. The new iPad is available to order beginning Friday (March 24) in the US and more than 20 countries and regions including Australia, Canada, China, France, Germany, Hong Kong, Italy, Japan, Netherlands, Spain, Sweden, Switzerland and the UK. Denmark, India, Mexico, Norway, Russia, Turkey and other countries and regions will follow in April. Brazil, Taiwan and other countries and regions will follow in May. Polyurethane Smart Covers for iPad are available for £39 in charcoal grey, white, midnight blue, pink sand and (RED). Check out our latest iPad deals.